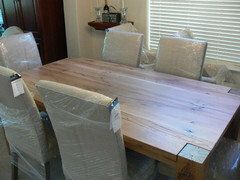 Just purchased a dining table from Restoration Hardware (Dumont rectangular dining table). It's a rustic unfinished wood. I feel like this table is not going to withstand everyday use. This table will be our everyday table and I can't return it (purchased from outlet). Anyone know the best way to protect the table from common spills and use, yet keep the rustic look and color. @suzanne_rupp – Thanks for the compliment! I made this table from new wood and sold it for $1,400. I can get pretty much anything shipped across the country for around $350, so considering your alternatives, it might be worth it to you. Anything reclaimed this size usually runs over $3,000 (from a retail giant like Restoration Hardware). I also received a couple of quotes from individual artisans who deal exclusively in reclaimed lumber, and both quotes were over $4,000. Of course, if repurposing (and the story that comes with the wood) is important to you, then by all means, make the investment. 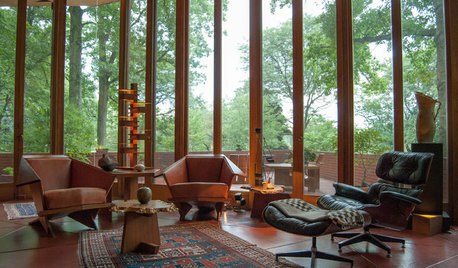 But for a lot of folks, the aesthetic is what they're after. They're my market. It started as new wood. I choose my boards based on their texture, using the most pitted boards I can find. First I burned the surface with a propane torch and then sanded. Next came a vinegar/steel wool solution that oxidizes the wood, turning it gray. After that dried, I applied a whitewash of thinned chalk paint and rubbed it down with a dry rag until it reached the desired effect. The tung oil goes on last (6 coats.) In between each I sanded with 400 grit and finished with 600. It feels like heaven. I've ordered some of the Rubio Monocoat for my next table. I can't wait to see how it turns out. rkwrightj,,,,why are you using tung oil finish? very little pure tung oil in there. mostly chemicals. Actually, it's considered a wiping varnish. are the ingredients petroleum distillate or mineral spirits? varnish. I use pure tung oil on my wood projects. you thin it (its viscous) with natural citrus solvent (it's like mineral spirits but non toxic). it helps you apply the oil and then evaporates. All of those finish items are not what they claim to be. In fact, read the label of your tung oil finish and see what's in it. pure tung oil will not raise the grain on your wood so there is no need to sand in between coats. Look into the 100% tung oil (amazon or Real Milk Paint Co. will ship). 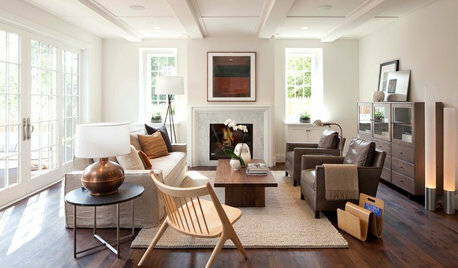 Have you checked with Restoration Hardware. Most of these tables have several layers of finishes on them. 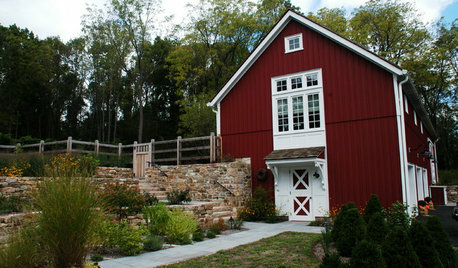 It may look rustic unfinished but could have several layers of a matte finish. Before you add an oil rub you should make a few calls to the company. Don't destroy that beautiful finish without reaching out to the manufacturer. 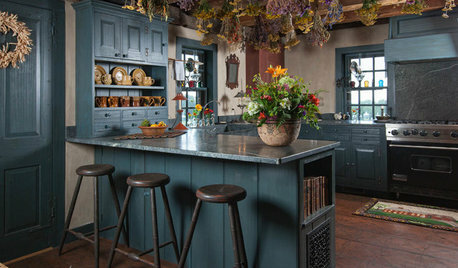 Oil may change that rustic look and color stain. I work for a major Design Center and our tables although they look unfinished have about 7 layers of a matte finish. A five minute call may save your table. Hope it works out for your. rkwrightj - if you are planning to use the Rubio Monocoat for the tables you build, please TEST thoroughly first. Using Rubio 2C Pure, and the UMO on our floors was very disappointing! We do, however, really like the look and feel of hardwax oil products. We found the Osmo brand to be far superior in ease of application and protection. there is an entire thread on here (from a few months ago) devoted entirely to RH table finishes and Rubio. just do a search w/those key words. Beth H – you're right. It IS a tung oil finish. I did mention the name of it, but then just referred to it as tung oil after the fact. Sorry. I didn't mean to mislead anyone. Thanks for the clarification. Regardless, the finish is gorgeous and I tested a lot of liquid and oil spills on extra pieces before finishing the entire table. I left overnight and wiped up the next day with no trace. The customer loves it. @Mary Elizabeth – I've read another thread on the Monocoat and RH unfinished tables. Most folks have very good things to say about it, but there ARE a few who were unhappy with the results. What, in particular, were you disappointed with? As Beth H stated, there are several other threads regarding the RH table, as well as separate discussions for Rubio (on floors). After living with it for a year, the Rubio 2C plus the UMO did not hold out moisture or stains. Oooph. Good to know. Thanks! I have this same table in black too! Did you find out an answer? I'm wondering how to protect it. We just bought it. Hi jwsargent4. Thank you so much for your posts, they are so helpful! Just wanted to confirm how many coats of each product you had used: 3 coats of the General Finish High Performance Poly Flat and 2 coats of the General Finish Flat out Flat? Thanks! Does anyone have any long term followup in the general finishes treatment? I have the 17cc Priory rectangle table in weathered natural arriving tomorrow. I will be using the GF products to seal the table. Has anyone just used the flat out flat by itself or is it recommended to use the GF high performance poly coat first.? Did y'all sand between coats and as far as the foam brush did anyone use a foam roller or is the brush better. The general finishes website has most of this info on it and is a great resource. First off, the HP Poly will add more protection that the Flat out Flat by itself. HP is an awesome product. I did a lot of research before choosing this particular clear coat. You can use one or the other or both. The HP Flat still has more of a sheen than the FOF. You can use the HP first for the better protection and then the FOF to dull down the finish, or only the FOF. I did 3 coats of the HP and then 2 Coats of the FOF on our salvaged grey oak table, and it looks AWESOME and I don't worry at all about spills. Some of the pics from my table are posted earlier in this forum. FYI, the more flattening agents added, the slightly less durable the finish is. So, a Satin HP is more durable that the Flat HP. If you are going to use the FOF on top to achieve the flattest finish anyway, then I would use the HP Satin first. I used a foam brush with excellent results with a VERY light sanding (just barely scuffing the surface) with a very fine sponge sanding pad to knock down barbs in between coats. I think it would be harder to get the clear coat into the cracks and uneven areas of the table with a roller. Did you do just the table top or legs/base too? Thanks jwsargent4. I plan on following your lead. I will only be doing the top. The table has arrived!! @rkwrightj I am in the middle refinishing my rustic reclaimed wood farm table and had a follow up question on the Formbys Tongue Oil. Do you know how this has held up? My dad recommended Minwax Tongue Oil but it would take a few days to get, meanwhile my table is in my yard, and the Formbys is already in hand. Here's another question, my husband is a sandblaster, so I had him sandblast the table first, I have since sanded it to smooth out the rough finish. 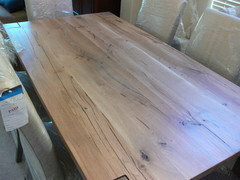 So my table has valleys and grooves (very rustic), have you used Formbys on a table with more gooves and valleys? Finding the right finish is stressing me out. I want something matte that holds up to stains and water rings, but I don't want it to eventually turn sticky when you clean it. Hence the reason I am refinishing it to begin with. I have used pure tung oil. after repeated applications, it does harden, somewhat. you still have to be careful w/wet glasses. it will leave rings. It doesn't stay tacky if cured properly before use. I don't know about minwax. it has to be a pure tung oil, not a tung oil FINISH. lot's of chemicals in the finishes. @Beth H thanks for the info. After doing lots of online research I still wasn't satisfied with all the knowledge I learned. I decided to just leave the table with stain only and use place mats when eating. YOLO! Fortunately my kids are all teenagers so I have less accidents, but they are all boys (Yikes). I figured if something happens, I can just sand it, and touch up with stain even though I have access to my own personal sandblaster. I waited 3 years for him to sandblast it, and it was a lot of work for me palm sanding it afterwards to get a smoother finish. I'm just too scared that after a few years of use it will once again have that tacky/sticky feeling when you wipe it down with a wet rag. Nothing I hate worse than your arm sticking to the table. Photos of the before and after. why don't you try General Finishes Dead Flat top coat? I 've had friends of mine use that. it leaves a great protective finish w/no change in the wood. of course if you want a shinier finish, you could do that as well. GF is a great product and I've used it for years. Amazon. The General Finishes Performance Flat is also great -- flat as can be, easy to apply, and protective. I posted some photos of my RH table with three coats of the flat (see my previous post). You have a lovely table! 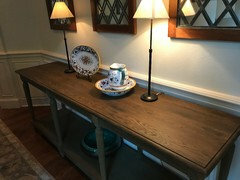 I finished doing a Restoration Hardware console table using the general finishes high-performance polyurethane in satin and then topcoating with general finishes flat out flat. This is my second time using that combination and I love the finished product! 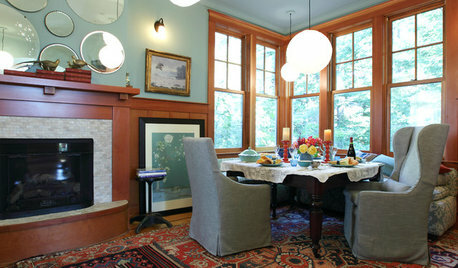 Did the monocoat oil darken the color of the table at all? I used general finishes flat poly 3 coats and then 2 coats of gf flat out flat. It looks great. I applied with a foam roller, sanded lightly between coats. Did not change look of table one bit. Super easy. It will mellow and become more rustic with use. I read to the end...thanks so much for everyone's input. 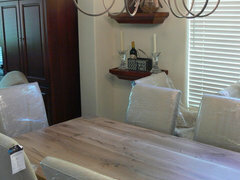 I was at a loss on how to protect our new RH table while maintaining the reclaimed wood effect. I'm planning to go with a few coats of General Finishes HP Flat as I don't mind just a bit of sheen. However, quick question...our table which we got from a RH outlet is VERY dirty! I wiped it down with a damp cloth and had to rinse the rag 20 times. Every wipe left the rag completely coated in black. I couldn't tell the table was so dirty until I started wiping. Is this normal with reclaimed wood? If so, is there a special way to clean it before finishing? Or is it ok to just give it a good wipe down before applying the finish? In one area, once the wood was cleaned, that one small area became a ton lighter than the rest of the table and it stands out. Oh, and what is your opinion on the Howard FeednWax Polish and Conditioner? Will this change the look of my reclaimed wood table? It is highly rated and reviewed, but no one mentions it or Renaissance Wax in this thread. Is that because any sort of wax will not be good for the look of the table? I'm a first-time rookie in this area. Thanks, Karen! Yes, maybe I was wiping off some of the lacquer and that's why the rag was so black? Also it uncovered the lighter wood in that one area and maybe I wasn't supposed to do that. I just don't like the thought of our family eating at an uncleaned table, so I thought there would be no harm in wiping it off with a bit of warm water with a tiny bit of soap. Maybe I shouldn't have done that. Thanks for the input on the wax. I think we'll avoid that unless I find new info. The RH salesperson told us there was absolutely zero finish on the table, but maybe he was mistaken. Plain stained wood isn’t a “finish”. It’s a surface color alteration that can be damaged or removed by normal wear and cleaning. Unless it is protected by a finish. Which RH refuses to do. But people continue to give them masses of money to buy furniture that cannot perform the function for which it is designed. yes, i felt cheated spending THAT much on a table and they don't even put in the bit of work it would take to put a simple finish on it. so did i permanently damage the table by cleaning it with soap/water? that spot where it's lighter does stand out, but not that big of deal since we intend to not worry about the rough look. 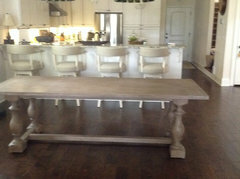 we were tired of keeping our finished Pottery Barn table so perfect with 5 boys! hi debbieduke. I have the same table as you. Can I ask which exact general finishers you used and what was the grit number of the sand paper you used. Thanks in advance. 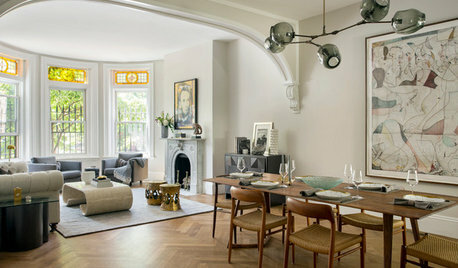 I have the RH herringbone dining table in weathered brown oak. It's beautiful, but unfortunately I had to return the first one that was delivered to me due to a wood chip being bent back and breaking off. Then, I was ever so gently wiping off the next one that was delivered to me when another wood chip bent back causing you to see the natural color of the wood once more. Has anyone had this problem? 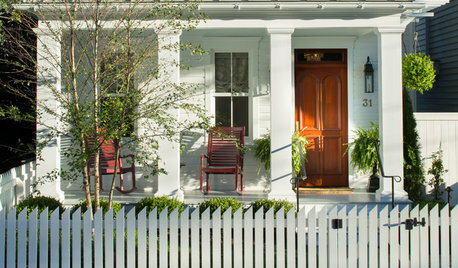 Will a protective sealer or oil protect the wood from flaking off, or will that simply protect from water stains? Did you ever try the General Finishes two part treatment? Please let us know if you're still checking this thread. Thanks! @pthaggard can you give an update on the Mondern Master finish? I bought a canister but now I’m nervous based on some previous posts. I compared General Finishes "Flat," "Flat Out Flat," and "satin" on a Restoration Hardware reclaimed oak table (bare wood after sanding). The "Flat" and "Flat Out Flat" seemed equally matte but the "Flat" seemed to have the least effect in terms of changing the color (very minimal). "Flat" also offers more protection than "Flat Out Flat" if that is a factor. See photos above (Kristin, June 28, 2017 post). It was very easy to apply. Haven't tried Modern Masters Dead Flat. 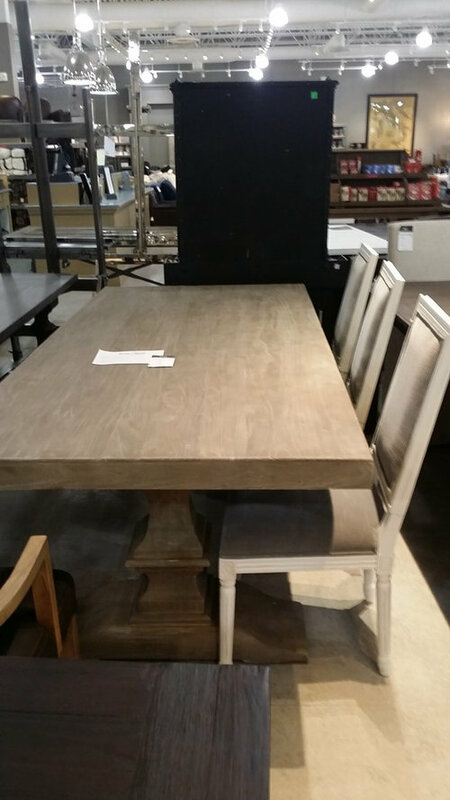 I compared General Finishes "Flat," "Flat Out Flat," and "satin" on a Restoration Hardware reclaimed solid white oak table (bare wood after sanding). The "Flat" and "Flat Out Flat" seemed equally matte but the "Flat" seemed to have the least effect in terms of changing the color (very minimal). "Flat" also offers more protection than "Flat Out Flat" if that is a factor. See photos above (Kristin, June 28, 2017 post). It was very easy to apply. Haven't tried Modern Masters Dead Flat. @jwsargent4 and @Kristin - has held up over the last 2 years for you? I have wanted the Reclaimed Russian oak in the grey wash forever.. finally pulled the trigger, and now I’m a nervous wreck about it! 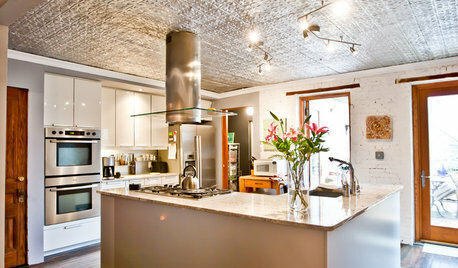 We use MM dead flat on many of our cerused projects with great results. Any finish I have seen will not protect from water unless you use apply regularly also...a wax product over a lacquer sealant....or a polyurethane varnish. After that,or instead of that option, go online or find a commercial business that deals in upholstery fabric. There you can purchase a heavy quality piece of CLEAR plastic to use as a 'table cloth' over your table. You could also place a vinyl tablecloth(one that has a reverse side that is fleece...usually you can find them at places like Target or Family Dollar stores, or anyplace that sells camping supplies or picnic supply departments. I have 2 kids who I am so afraid will not use placemats, etc. I will definitely try underneath first. If it is truly unfinished, you could apply mineral oil with a soft cloth. It WILL change the color of the wood. I have used mineral oil on my butcher block island counters for years. The unfinished oak was almost beige in its natural state, but turned a beautiful golden brown color with the application of mineral oil. The other choice would be a commercial wood sealer recommended by your local paint store. It will probably not need to be reapplied like mineral oil does. Why does my POOL Room look unfinished? Considering unfinished mango wood table... bad idea? 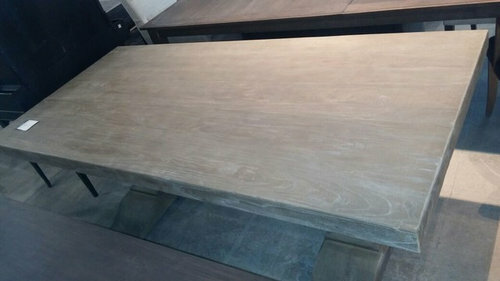 How to protect unfinished RH wood dining table?